DISCLOSURE: This post is brought to you by Lucerne® Dairy Farms and Safeway. All opinions and holiday meals I eat are of my own choosing, but these guys brought a little bit of home (the West coast) to us here in the Florida Keys. As I’ve shared before, living and traveling in a RV, I can become a little disassociated with what’s going on in the world. I can go days without knowing the date the actual date! Which is why it is especially important for me at this time of the year to create a little holiday atmosphere for Mr. Misadventures and I.
I’ve never been one to decorate or power shop. Being the foodies we are, for the Misadventures household celebrating the holidays means seasonal treats and specialties. We are a Franco-American couple who likes to travel and eat locally (when we can), so our holiday traditions usually aren’t conventional. This year for Thanksgiving, we’ll start with a traditional starter in France, foie gras with a nice glass of champagne. At this time of year I like to serve the foie gras with a little bit of cranberries on top. Those crisp berries not only add a crunchy texture, but also a nice tartness that rounds out the gamey liver taste. 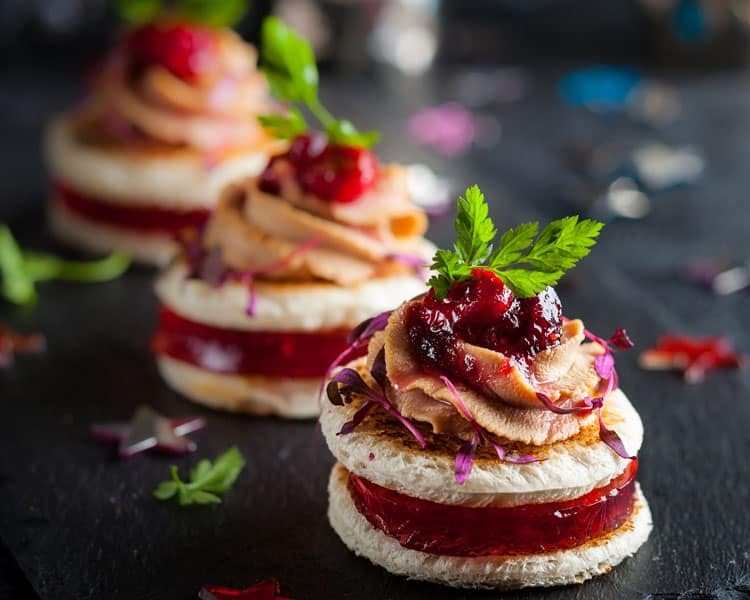 Foie gras and cranberry chutney. 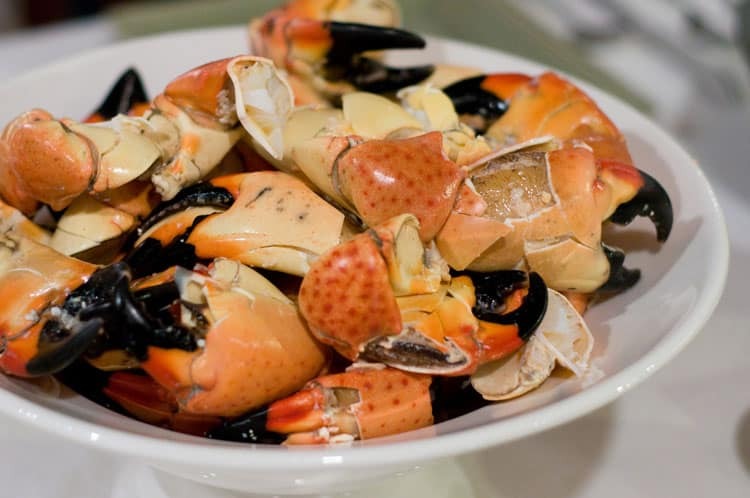 Given that we are in Florida with an abundance of seafood available to us, we are going to feast on stone crab claws, followed by whatever fresh fish we can find the day before, probably snapper, it’s in season right now and terrific. If we can’t find fresh fish, we will go with Cornish game hens which will be easy to prepare in our Staub dutch oven. For dessert I want something more traditional and American. I will never take pumpkin for granted. While we were living in France it was impossible to find pumpkin baked goods, and finding a can of pumpkin was like finding gold! Since then, I make sure I get as much pumpkin desserts as I can when it’s the season. We’re not in San Francisco this holiday season (sniff-sniff) so I decided to bring a little San Francisco to me here in Florida. I’ve got two of San Francisco chef, Jeff Anderson’s no bake pumpkin recipes which are perfect for the RV. Jeff is the Executive Chef of Safeway, Vons and Pavilions grocery stores. Not only has he created some amazing recipes for the holidays, but he’s from San Francisco, so I know he knows good food. Sorry (not sorry) San Francisco peeps are all foodies! Safeway holds a special place in my heart. When I moved to Hayward in the San Francisco Bay Area at age eighteen to go to school, Safeway was my local grocery store. I grew up shopping at military commissaries and couldn’t get over how much California and this grocery store had to offer in comparison! When I started my first corporate job, it was in an office building inside the Safeway shopping center, I bought a lot of lunches there! Also it always put a smile on my face because the store was on the site of the original Hayward High School where my grandmother went to school as a teenager. My disabled cousin and her disabled husband worked at the same Safeway in San Jose for decades and I always appreciated that the store employees provided the opportunity for my cousin to have a normal life. I didn’t see my cousin often, but when I did it was usually Christmas Eve, so I always think of her around this time of year. All this to say that I believe Safeway is good company, with good products and good people. People like chef Anderson. 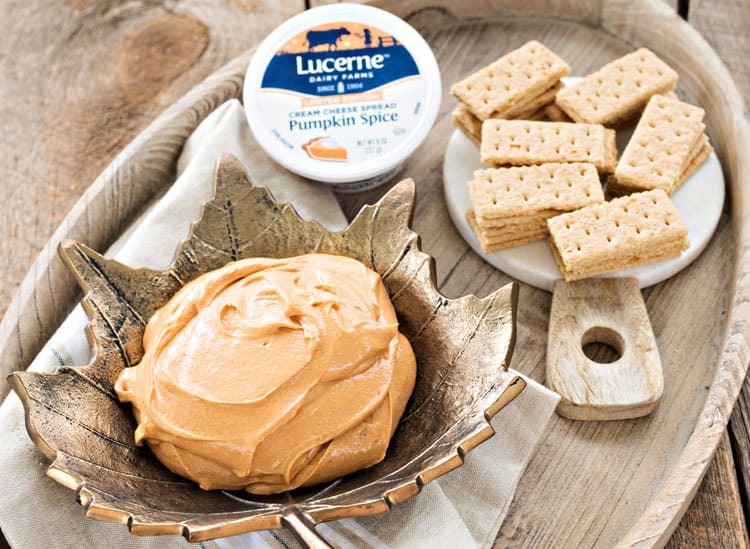 Lucerne® pumpkin spice dip. Photo courtesy of Safeway. Since I’ve got limited kitchen space, I am preparing them the day before. 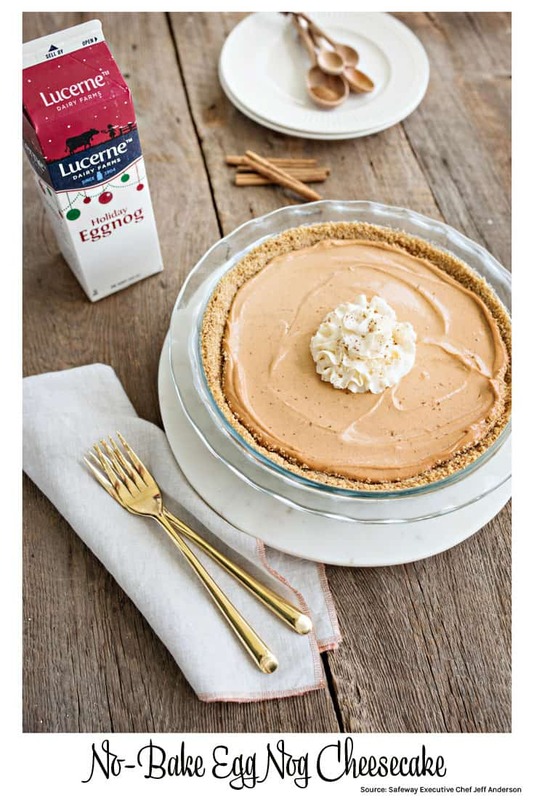 On Wednesday evening I’ll throw together the super easy Pumpkin Pie Dip to snack on pre-holiday while I am making No-Bake Eggnog Cheesecake for after dinner on Thanksgiving. By making them ahead of time I only have to focus on the main course and side dishes on the actual day. 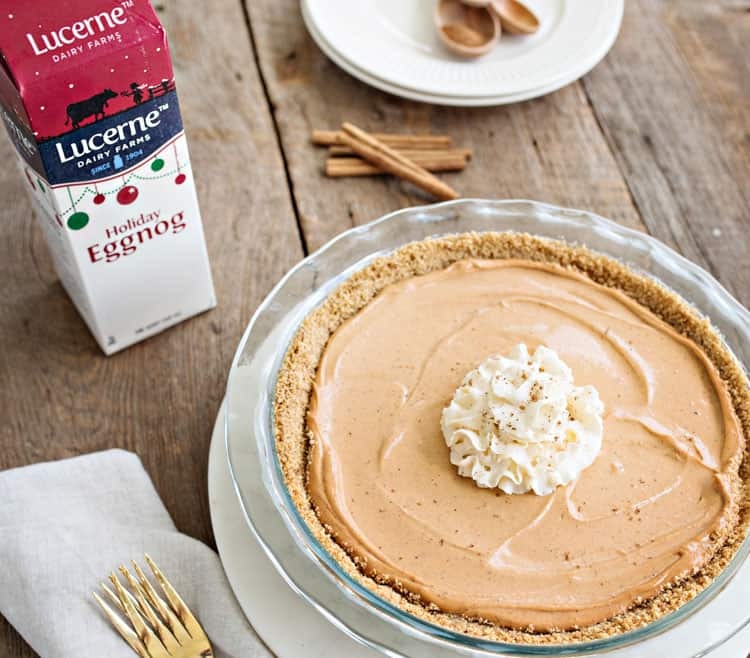 Lucerne® Eggnog Pie. Photo courtesy of Safeway. Do you know what makes these dishes? Good dairy. I can tell you the importance of fresh egg, butter and milk, because when you don’t have them, it’s a disaster! How to make a French husband depressed? Deprive him of butter! 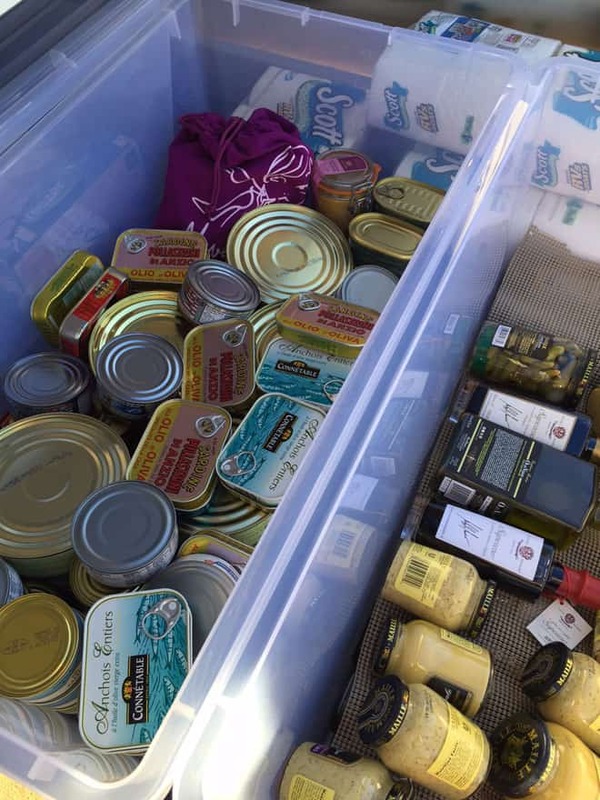 You know we have a serious supply of dry and canned goods in the RV. We also stock our freezer with fresh seafood as we come across it. 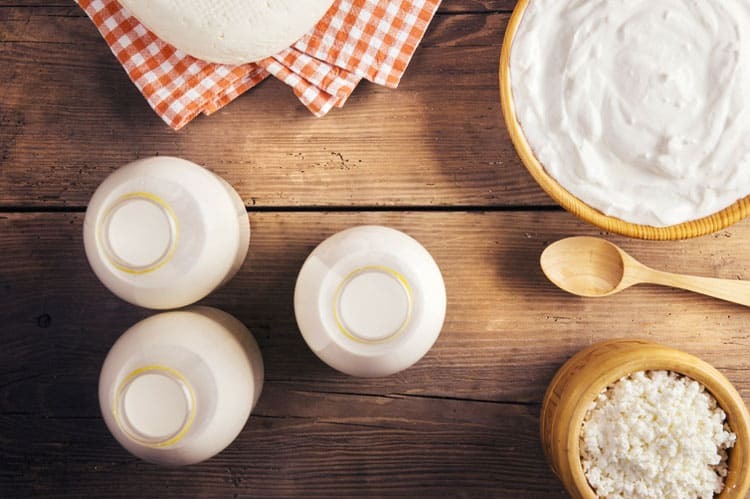 But whenever we head out on the road for our next trip, we stock up on the essential fresh items milk, eggs, butter (and cream cheese for our bagels!) – usually at a nearby Safeway, Vons or Pavilions store, because as long as we have these, we can create nearly anything from our dry stock. Where you get them makes a huge difference and I have been deeply disappointed with most of the large grocery stores we’ve come across in the Eastern part of the United States. I can’t tell you how happy we are when we see that red “S”! Shopping at Safeway, I know we’re going to get great high-quality and affordable Lucerne® Dairy Farms products, available exclusively at their stores. And don’t get me started on eggs. I am the ultimate egg eater and I want quality eggs! Soooo…..that’s Thanksgiving, but what about Christmas? Well, I am a HUGE fan of pumpkin bread (banana too!) and often ask my mother to send me some whenever she is forwarding mail. 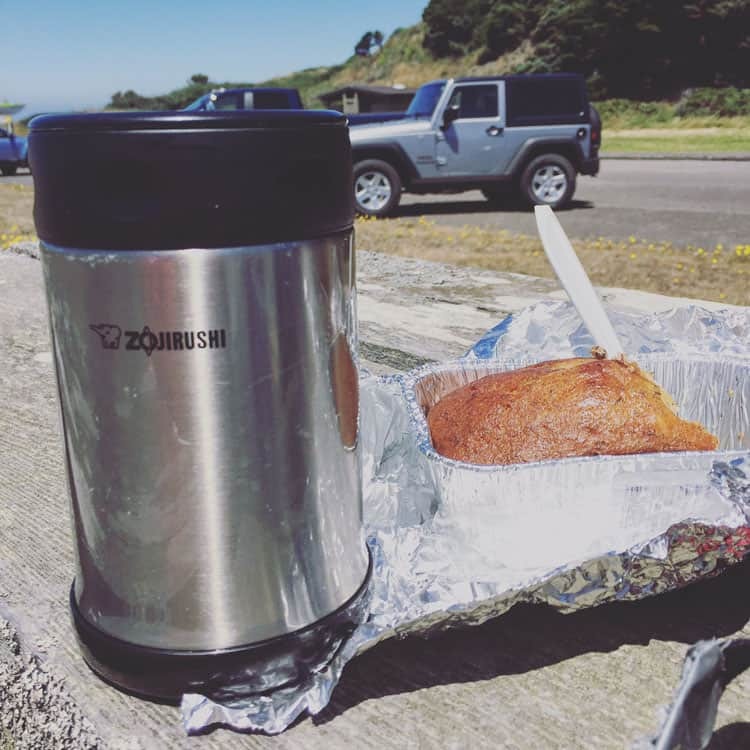 Picnic with Mom’s Banana Bread. When my mom’s isn’t available, I’ve got Chef Jeff Anderson’s pumpkin bread pudding (I love bread pudding!) recipe, which I can easily adapt for the RV. I can smell it already! I want to thank chef Anderson for creating such delicious easy to make holiday recipes with fresh ingredients. I’ve chosen two that are not only RV-friendly and they are going to bring some San Francisco cheer to us on the other coast. How about you? What kinds of meals do you make for the holidays? If you travel away from home, how do you simplify your holiday meal? What’s your favorite holiday dessert? 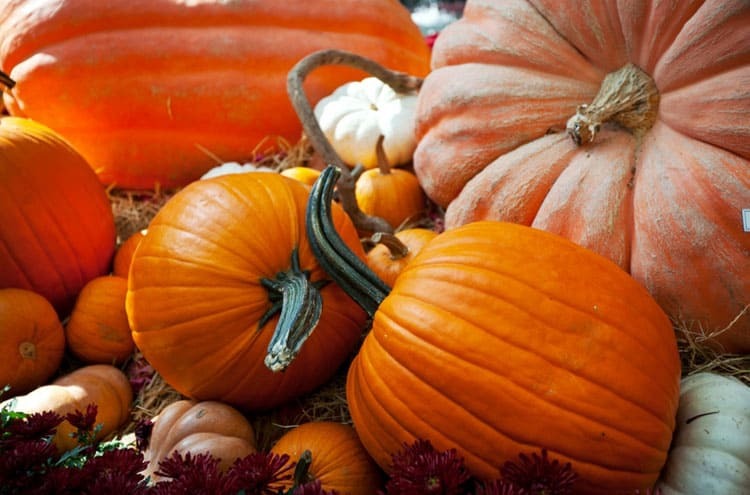 What’s your favorite pumpkin recipe? DISCLOSURE: This post is brought to you by Lucerne® Dairy Farmstand and Safeway, but my holiday meal selection and opinions are my own. I’ve created Pinterest-sized images with chef Anderson’s desserts. Like them? PIN it! Wow! The Foods are all great and delicious! We tend to keep it pretty traditional here since my sister is a T-giving fanatic. But when I’m hosting, we do everything with a bit of a twist. Justin is smoking the turkey, I’m making the green bean casserole from scratch with fresh French beans, truffled mashed potatoes, German stuffing with sourdough bread and cranberries, a sweet potato soufflé, and our biggest non-traditional part will be dessert because my husband makes cheesecake. This year it will be creme brûlée. @Katie, that stuffing sounds phenom! I wouldn’t turn any part of your meal away! How do you make truffled mash potatoes in a way that doesn’t overpower anything else? Do you use truffle or truffle oil? I use truffle butter. Though now you have me intrigued about buying real truffles for this… if I knew of a good source and it wasn’t too late, I bet that would be phenomenal! @Katie, I think there are a lot of fake truffles out there, so I am not sure. Truffle butter sounds like a great way to go. You’re absolutely right, it’s good to prepare ahead of time! It saves you from all the stress of cooking everything in such a short period of time. I am liking this recipe that you have here especially since it’s no bake! @Elizabeth, it’s the only way to go! Omg everything looks and sounds delicious!!! I just love this time of year!!! @CourtneyLynne, thanks, what is your favorite food this time of year? @Laura, I’m currently in the South, so I’ve been trying to find a good pecan pie to eat! It’s amazing how you can use one thing in so many ways! We love using spread on our crackers. Homemade ones are the best. @Fatima, I agree! What’s your favorite? Oh my goodness this looks so good. I want everything on the list. I can’t get my hubby to eat seafood. Stubborn man. I would try all of this in a heartbeat. @Valerie, my hubby doesn’t like Mexican food so I have it when he isn’t around, I’ll guess you have to do the same with seafood! Our neighbors go RV’ing a lot . They would definitely find this post helpful for eating out on the road. @Maria, I hope you share it with them! That is RV food like I’ve never seen before! Yum! Your recipe for Pumpkin Pie Dip sure sounds amazing! I’m a sucker for all things pumpkin, especially during this time of year. As for our Thanksgiving meal, we keep things pretty traditional. @Kristy, nothing wrong with traditional! I didn’t create the recipe, that was Safeway chef Anderson, but I’ll take it! I guess if you have to do it that way, might as well do it in style! 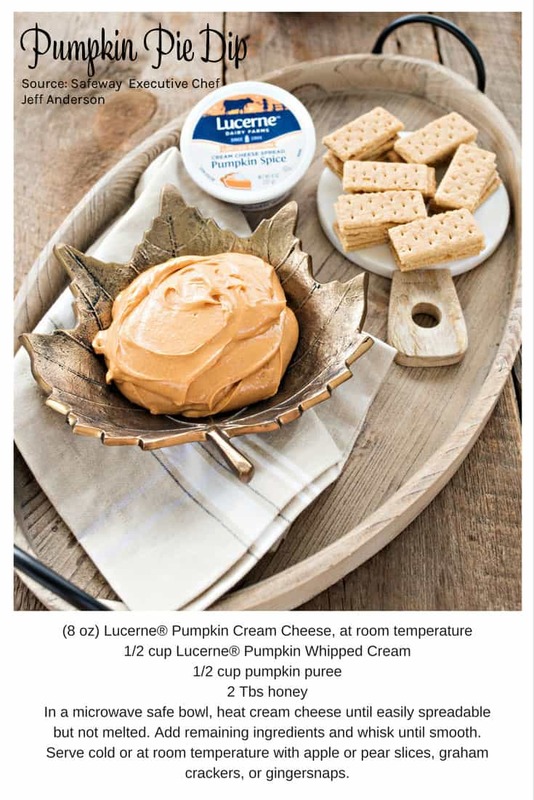 Love the pumpkin pie dip! @Azlin, got to make it tasty! That foie gras… I die. Making a pumpkin pie dip is more my speed… I need to make that for Thursday! @Chelley, yeah, I’d rather enjoy they day than spend it cooking and cleaning! Everything looks delicious. I swear all these holiday food blog posts are making me so hungry! Great post! @Neely, I feel the SAME sentiment when I look at my Instagram feed! I love the sound of a no bake pumpkin pie! When I tried baking a pumpkin pie last year it did not turn out well. @Michelle, try this recipe, its fool proof! These are looks fantastic! The no bake pumpkin pie sounds delicious. @Dogsvills, the easier the better, right?! Wow! Your Thanksgiving feast sounds absolutely divine! How exciting and free it must be to get to live and travel in an RV! We enjoy a traditional Thanksgiving, and I like to get creative with the left overs! That dip looks and sounds great. I agree that fresh dairy is key to a successful and delicious dessert! @Kristi, thanks! The “freedom” end Feb 1 when we end up in Portland looking for jobs again. We are enjoying every last moment until then! These all sound like delicious foods! I’m jealous that Canadian Thanksgiving is over and I have to wait until Christmas to have a feast like this. Enjoy your holiday! @Nellwyn, what did you make for your Thanksgiving? My mom is the real chef in the family and I’m just her second-in-command but we did turkey and ham with potatoes and squash, pumpkin pie and apple crisp… It was amazing! @Nellwyn, that sounds amazing, especially the apple crisp! Loving how you are living on the road. I had no idea you were just in my neck of the woods (Ft Myers!) and I am going to have to follow you on your adventures. That pumpkin looks AMAZINGLY easy and delicious! @Krystal, I was there for two weeks, sorry we missed an opportunity to meet! There is so much to do in the Ft. Myers area! The leftovers make for an amazing crab eggs benny too on Christmas morning! @Murissa, we don’t have an oven, I’ll have to save that delicious sounding crab dish until we do! These all looks delicious! I can make all of these, this coming Christmas. My family would love this for Christmas dinner, the pumpkin looks the easiest. It’s good to have a store that you can go to for healthy food especially during the Holidays! Everything looks really good, I kept that Eggnog Cheesecake recipe! It’s amazing! I can’t get enough of pumpkin things these days either. That dip looks amazing. as does the eggnog pie. Sounds like you have a very gourmet holiday planned. @Cindy, our life revolved around good food, so we try to make every day gourmet in some way! @Aurora, we are total foodies so we eat well wherever we go! 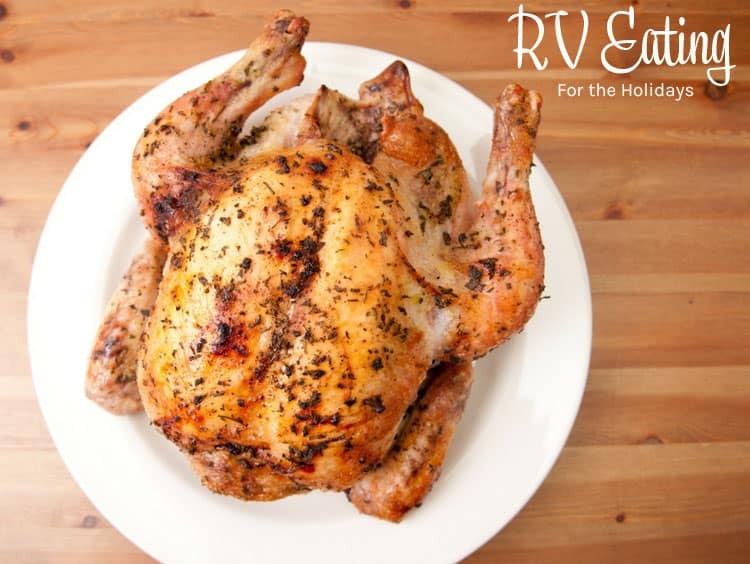 Now that would be a challenge to make a big holiday meal on an RV, but you’re totally on it! Your menus sounds awesome, Andi and that eggnog pie looks great. Is there a recipe for it? @Christina, yes, hit the eggnog link in the post and it goes to Chef Anderson’s recipe on the Safeway site. I tried that last night, but it just takes me to the pin on your site. wow, What a yummy meal! this is really perfect on holiday Glad you share this with us. All this talk of food and thanksgiving has me hungry, that cheesecake looks really delicious. @Anosa, it tasted as good as it looks! wow I wanted to try living or staying in a RV as well, my daughter would love this Idea! that crab claw looks beautiful! now i’m craving for it! @Tauyanm, it has been a lot of fun. The crab claws were delicious! Let me tell you what I would be eating if I were traveling around in an RV. Subway sandwiches. And, possibly, some other fast food joint! I’m so impressed that you can make such wonderful dishes with such limited space! Go yoU! Everything looks absolutely delicious! You are so lucky to have access to all that amazing fresh seafood. My mom loves pumpkin pie so I’ll have to make a batch of the pumpkin pie dip for her to try. It looks delicious. These are all such great ideas if you are traveling like this for the holidays. I have a friend that I could pass this along to. I love cheesecakes and all sort of dairy products and want to try them all because I am craving on it now. I love cheesecakes, the no bake eggnog cheesecake and all sort of dairy products and want to try them all because I am craving on it now. All this wonderful food, I’m hungry.